Escalators & Moving Walkways Market size will surpass USD 20 billion by 2025; according to a new research report by Global Market Insights, Inc.
Increasing urbanization owing to growth of industrialization and infrastructure in developing countries such as China, India, and Indonesia for better income opportunities and standard of living, will spur the demand for energy efficient and eco-friendly escalators and moving walkways market. Significant number of people move into urban cities each day resulting into a growth of the installed base. According to WHO (World Health Organization) the urban population in 2015 accounted for 54% of the total global population. These urban demographics will boost the demand for airports, high-rise buildings, shopping malls, complexes, hospitals, skyscrapers, metro stations, and schools. The escalators and moving walkways have become an integral part of these buildings for easy transportation of people and goods thereby, spurring the market demand during the forecast spell. The product is said to bear a high cost label owing to its continuously upgrading technology coupled with superior and sustainable designs. The moving walkways and escalators are said to be eco-friendly modern design machines which ease the travelling of passengers, especially in the malls, shopping complexes, and airports. The product has a huge capital investment and instalment costs, which form the biggest restraining factor for the escalators and moving walkways market growth. Moreover, the need for continuous maintenance and repairs of the product leads to further hindrance in the escalators and moving walkways market growth. Considering product, the escalators segment has been further bifurcated into multi-parallel, parallel and others segment which consists elevators such as spiral, crisscross, etc. The parallel segment finds major application in shopping malls, commercial spaces, airports, and other conventional and public buildings. The segment is said to hold a major share of over 50% in the global escalators market by the end of 2025. 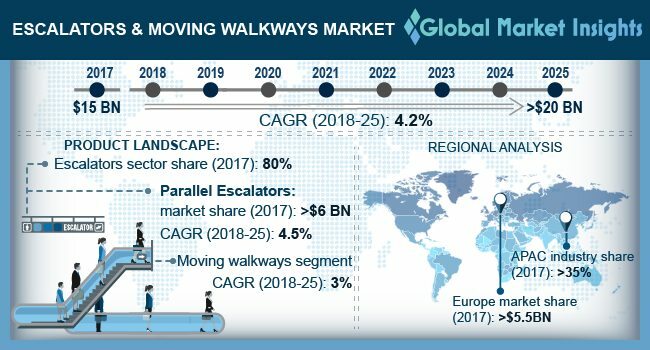 Moving walkways segment is said to exhibit decent growth in the forecast time spell owing to its increasing usage in airports and metro stations. This segment is said to surpass USD 430 million in the U.S. by 2025 with a CAGR of around 3% owing to huge number of airports and shopping malls. Based on application, the airports segment holds the second largest share and is said to easily surpass USD 4 billion by the end of the forecast time frame. China public transit application segment is said to grow at a CAGR of over 5% to surpass USD 1 billion by 2025, driven by the steadily growing urban population and working culture development in the country. Asia Pacific, strongly led by China, is said to have a significant share in the global escalators and moving walkways market owing to huge development and modernization activities carried out in the country. The India escalators and moving walkways market is said to grow with a CAGR slightly lesser than 5%. The moving walkways segment in India is said to surge to around USD 65 million by the end of the forecast spell. Primary manufacturers in the escalators and moving walkways market include Mitsubishi Electric, Schindler, Otis Elevator Company, KONE Corporation, Toshiba Corporation, Hyundai Elevator, etc. to name a few.